The Sly Collection is now available for PlayStation Vita. The collection was previously made available for PlayStation 3 both on disc and for download on PlayStation Network. 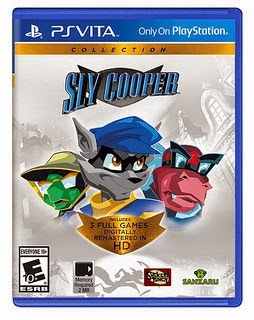 Fans that have yet to play the first three games in the series will be most interested in the new release, though the flexibility of playing the games on the go with PlayStation has to be a temptation for longtime fans of the Sly Cooper series that already own the platformer games on other consoles. The new collection packs some nice features that includes all three original titles with an HD facelift and PlayStation Network Trophy support that includes a Platinum Trophy for each game. Best of all, players can pick up the collection for a low price that makes the purchase a great value for gamers that don't already own these classic titles. The Sly Cooper series was first introduced with Sly Cooper and the Thievius Raccoonus for PlayStation 2 back in 2002. In the game, players battle to recover the title book that has been passed down in Cooper's family for years after it is stolen by the Fiendish Five, but the thief and his crew must also avoid the clutches of Inspector Carmelita Fox simultaneously. The first game in the series is one of the best, as it set the stage for the great platforming games that were to follow while also establishing many of the characters fans would learn more about over the next several releases. Sly 2: Band of Thieves was released two years later and is still regarded by many as the best release for the entire series. The game saw the return of the Cooper gang on a quest to find and recover the pieces to the Clockwerk after it is stole by the Klaww Gang. The pieces play a big part in gameplay with each granting new powers to its owner, and Sly will need the help when battling against plenty of mechanical minions. Carmelita returns in the game with a new partner named Constable Neyla to give the group even more headaches along the way. The third release and final game included in the collection is 2005's Sly 3: Honor Among Thieves. The game was the least well received of the three, but it still received above average scores from a number of publications. The title follows the Cooper Gang on a quest to defeat the dastardly Dr. M and regain control of the Cooper Vault all while the relentless Carmelita gives chase. The game introduced many new features for the series, and it's the best looking title in The Sly Collection and just one of the three that allows players to switch the game's graphics to 3D, though this means the game slows down to 30 frames per second at 720p resolution. One cool new feature included with The Sly Collection is PlayStation Move support that allows players to use the peripheral to enjoy some funny mini-games and unlock a trailer for Sly 4. PlayStation Vita owners will enjoy the same content with some bonus controls that allow players to use the touchpads for menu navigation and a few other things in the games. The biggest benefit to playing The Sly Collection on PlayStation Vita is the flexibility to enjoy these classic titles on the go for the first time ever though. Trophy Support gives players added replay value for the game, as they desperately attempt to unlock all of the in-game rewards available for the classic games. Three complete games and plenty of hours of entertainment simply means players are getting a great value for their money when picking up a copy of The Sly Collection on PlayStation Vita or PlayStation 3. The HD remakes are the best way to play these classic titles, and the collection offers a fantastic way to prepare for the release of Sly 4 in the near future. Now if only there was an easy way to play Sly Cooper: Thieves In Time, then life would be perfect. The Sly Collection is now available for PlayStation 3 and PlayStation Vita. The Sly Collection is rated E by the ESRB for Cartoon Violence & Comic Mischief. For more information on the game, check out the official The Sly Collection website.